I am usually not a huge fan of newer female acts. I never got the thing with Lana Del Rey or Björk. I found Haim to be pandering at times but I really enjoy Speedy Ortiz. There will always be a place in my heart for Fiona Apple, Lisa Loeb, and (early) Cat Power. 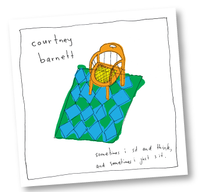 And then there is Courtney Barnett. Barnett is an Australian singer-songwriter who grew up outside of Sydney. Her style can be described as somewhere between Liz Phair and Jenny Lewis. She released her debut album, Sometimes I Sit and Think, Sometimes I Just Sit, this week. So far it has received praise by critics at Pitchfork (who called it Best New Music), AV Club, The Guardian, and others. Steroegum called the it the album of the week. Spin, who is quite fond of her album, booked Barnett to their SXSW Day Party this past week with Will Butler, Run the Jewels, Earl Sweatshirt, and Twin Shadow. Barnett is one to watch. Sometimes I Sit and Think, Sometimes I Just Sit has a multitude of high points. It touches on a variety of genres including country, 90’s alternative, dark-wave, and beach rock. She flexes her storytelling skills in songs about mundane occurrences, uncertainty, and broken relationships. “Elevator Operator,” the album’s opening track, explores struggles of fellow commuters over a steady drum beat. In “Dead Fox,” she ponders the rule of averages, organic vegetables, Jackson Pollock, cows, and sandwiches. “Pedestrian at Best,” the album’s single, is a gritty anthem. Her vocals flow like a stream of consciousness. She escalate in the choruses and sings, “Put me on a pedestal/ and I’ll only disappoint you./ Tell me I’m exceptional/ I promise to exploit you.” She seems to be bashfully avoiding all the accolades. Instead she wants everyone to know she is just a normal person. “Nobody Really Cares If You Don’t Go to The Party” is another standout track and makes an important point: no one is going to make you go to the party; you are your own boss. “Depreston” is a twangy track that shows Barnett’s range. “An Illustration of Loneliness (Sleepless in New York)” seems influenced by Phair and 90s alternative rock. “Debbie Downer” feels like a breezy song by The Go-Go’s. “Kim’s Caravan,” on the other hand, is a dark-wave song where “So take what you want from me” is repeated over and over again. “Boxing Day Blues” also has a bit of minor chord darkness. Lyrically, it seems that she gives up as she sings, “Lover, I’ve got no idea.” Like any person in their 20s, she seems to embrace somber tones and happy moments. It is that balance of both that makes her so captivating. If this album just a preview what Barnett can do, I applaud it. In this album, Barnett positions herself as a strong and talented musician with many things to say. In the songs, she talks on common experiences. She is breezy and dark. She is neurotic but it is very endearing. It is just like all of us.